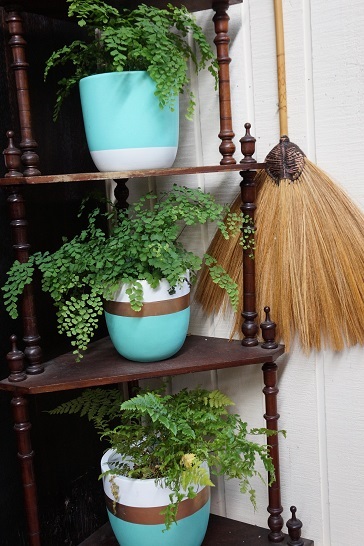 When you fill interior spaces with beautiful houseplants, you’re not just adding greenery. These living organisms interact with your body, mind and home in ways that will enhance your quality of life. Studies have proven indoor plants reduce stress, lessen anxiety, clean the air, relieve headaches, prevent colds and illness, improve brain function, boost moods and improve sleep. Wow! CSIRO have discovered the air inside homes and offices can be 5-7 times more polluted than outside – through toxins released by furniture, carpet, plastics, computers etc. These can cause headaches, nausea, loss of concentration and other health problems. Formaldehyde, benzene, carbon monoxide and xylene are all common volatile organic compounds (VOCs) that are emitted into the air in our homes daily. NASA have also studied the effects of plants and their benefit in space travel (Clean Air Study). 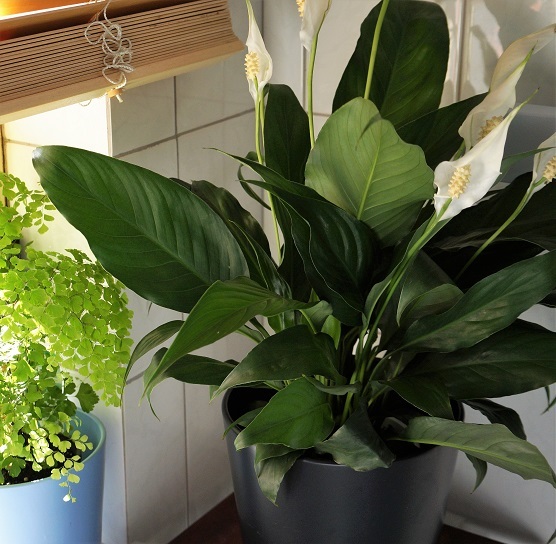 They found that just 3 plants in a 10 sqm room can remove up to 70% of toxins! 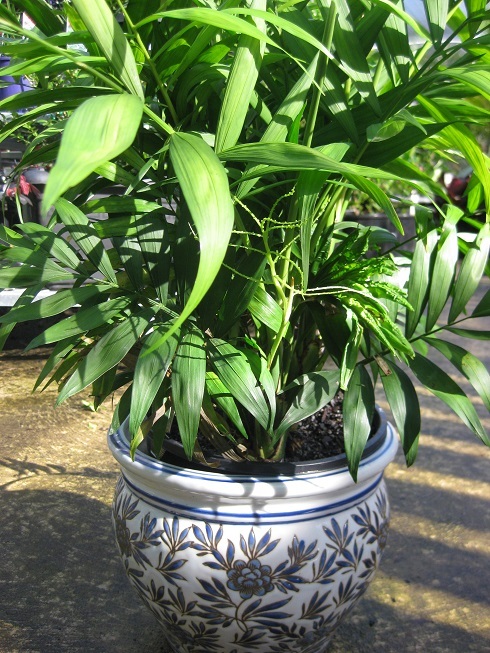 Effective plants include the Peace Lily, Kentia Palm, Spider Plant, Dracaena and Weeping fig. Simply take a pic of your room, then the app allows you to add plants to give you not only the look, but the health benefits as well! Very cool. 10 styles to choose from too. Plants increase the amount of oxygen in the air which improves the quality of air indoors and therefore your health and well-being. At night, photosynthesis ceases and plants typically respire like humans, absorbing oxygen and releasing carbon dioxide. A few plants like succulents eg Sanseveria and Aloe Vera, some orchids and epiphytic bromeliads do the opposite. They take in carbon dioxide and release oxygen all while you’re sleeping actually giving you fresh, clean air all night long! So those plastic plants might look okay but green life is best. Check out the video below to find out how Kamal even achieved clean air in his factory in Delhi just by adding plants, receiving an award from the government. Have you heard of Sick Building Syndrome? A modern phenomena thought to be factored by poor air quality, excessive background noise and an inadequate control of light and humidity. Indoor plants remove common dangerous chemicals and CO2 and release oxygen, reduce mould and reduce background noise. 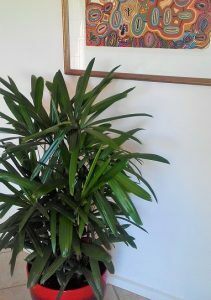 Having a plant in the workplace has positive outcomes, including increasing oxygen which helps you breathe easier, improving your emotional state, reducing negative mood states, reducing distraction, increasing creativity, and improving task-performance.These days we spend a lot of time indoors, so it is imperative we create air which is safe and clean for ourselves, our families and friends to breathe. Plants release up to 97% of the water they take in. A group of plants can increase the humidity in a room and this will improve your health. Your hair will be bouncier, your skin will glow and you will have less sore dry throats. 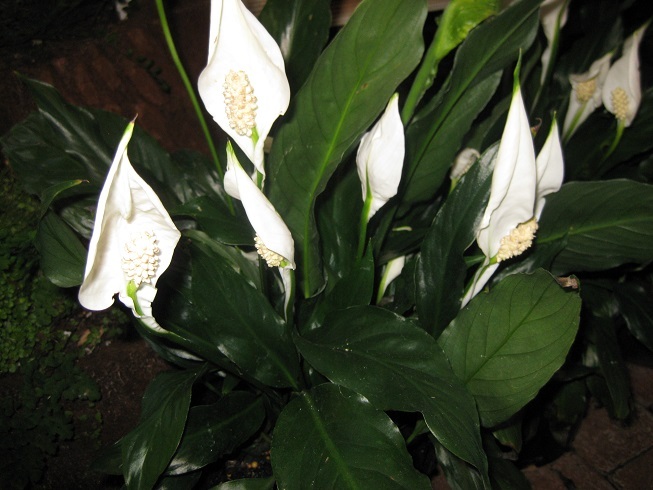 If you want to reduce mould, Peace Lily (Spathyphyllum) is the answer. This plant helps to reduce the levels of mould spores that grow in the home by absorbing those spores through its leaves and them circulating them to the plant’s roots where they are used as food. 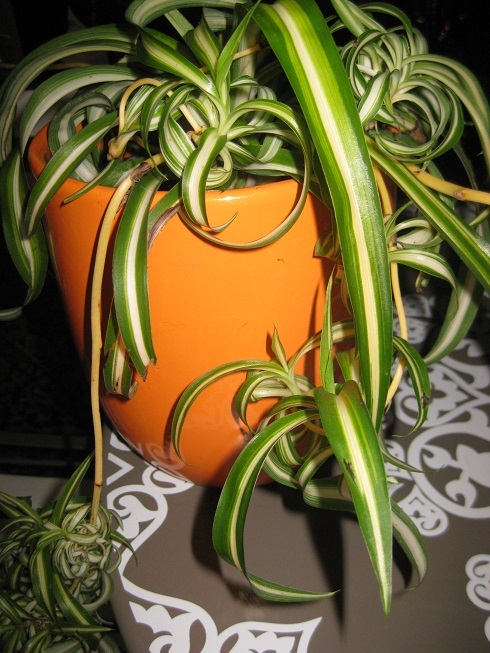 Spider Plants also reduce mould. High levels of carbon dioxide (CO2) can cause drowsiness, headaches and can lower concentration. Pot plants (legal ones) have been shown to increase attentiveness by 70% among students, that is amazing. 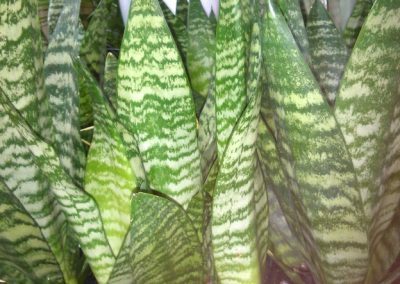 Succulents eg Sanseveria and Aloe Vera, Moth orchids and epiphytic bromeliads absorb CO2 and produce oxygen all day and night, becoming a natural air freshener. Put a pot plant in your study today! Plants are a proven mood booster. Just 1 plant can lessen feelings of anxiety, depression, confusion, fatigue and stress. Choose a plant with flowers to feel more creative, they help with idea generation and creative performance too. It has been shown that people recovering from surgery get better quicker if they have plants in their hospital rooms. They experience lower blood pressure, less fatigue and are released sooner! Imagine the benefits of plants inside your home. 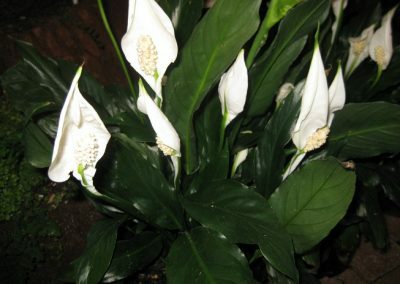 Peace Lily (Spathiphyllum) is a wonder in that it reduces all 6 of the highest producing indoor chemicals such as formaldehyde, benzene, trichloroethylene, xylene, toluene and ammonia from the air. It will also remove mould, and loves low lit and damp areas like bathrooms. 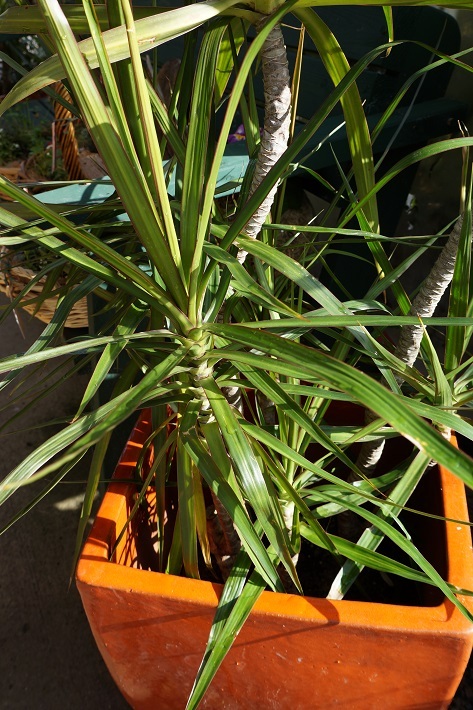 Spider Plant (Chlorophytum comosum) Purifies air rapidly – removes formaldehyde, benzene, carbon monoxide and xylene. Best for living spaces and are unkillable! 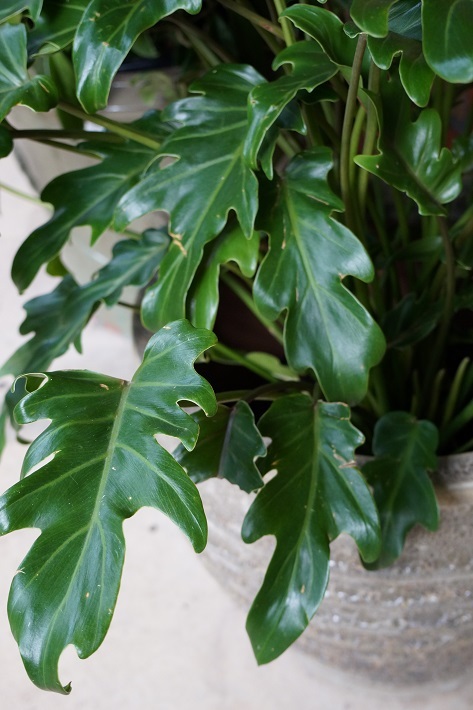 Philodendron (Philodendron) This tough glossy leafed plant is an all time favourite and will clean the air absorbing formaldehyde and carbon monoxide. It will handle most conditions with ease and look beautiful. 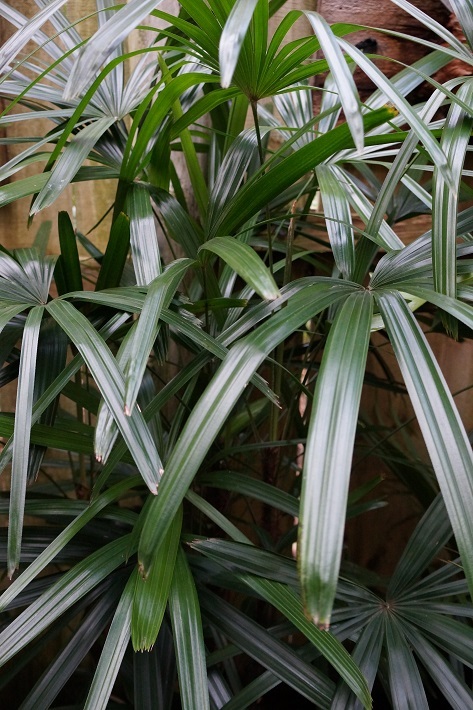 Dracaena (Dracaena marginata) A member of the Dragon Tree family. Purifies air; removes airborne nasties from rugs and furniture. Is happiest in living spaces and hot dry spots. It removes benzene, formaldehyde and trichloroethylene. Devil’s Ivy (Epipremnum aureum) A lush, tropical climbing plant. Loves warm indoor positions which are well lit. Found effective in UTS research to reduce toxins which may create loss of concentration, eye, ear, nose and throat complaints, headaches and nausea. 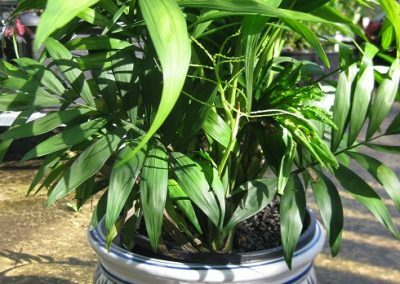 Lady Palm (Rhapis Palm) This glossy dark green clumping palm copes with low light and a broad temperature range. 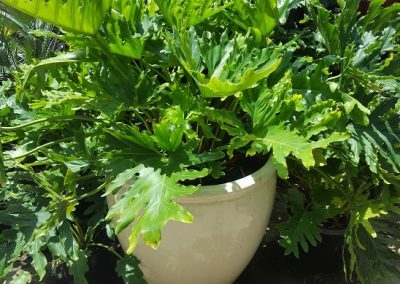 It is an excellent indoor plant, very slow growing so it can happily stay in the same pot for a long time. This plant also removes airborne toxins including carbon dioxide, formaldehyde, ammonia and xylene. Also, as well as simply making oxygen, Rhapis will make your home cleaner and safer to breathe and is reknown for being one of the easiest indoor plants to grow in the world. 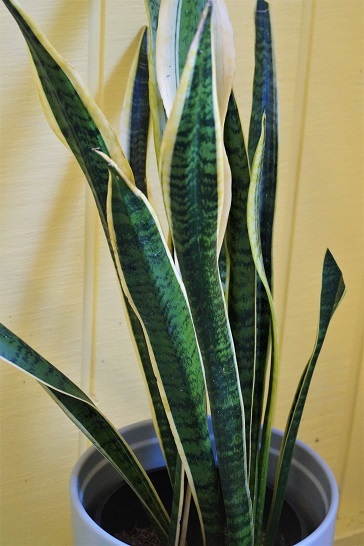 Snake Plant aka Mother in Law’s Tongue (Sanseveria). 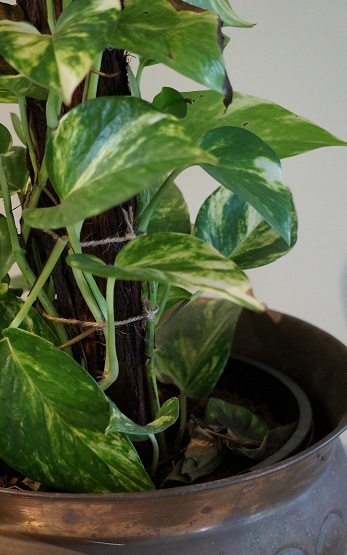 A tough and stylish house plant as it tolerates low light and irregular watering. It’s also one of the best indoor plants to remove toxins like formaldehyde, benzene, xylene, toluene and trichloroethylene found in modern furniture, fittings and buildings. It can even absorb CO2 and emit oxygen while you’re sleeping! 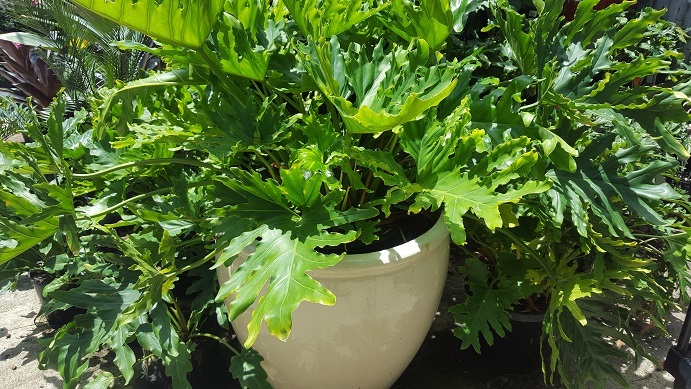 Use good-quality potting mix – this is one thing you should never scrimp on with pot plants.The more vigorous the plant, the more air it can filter, so it’s important to take good care of your indoor plant. 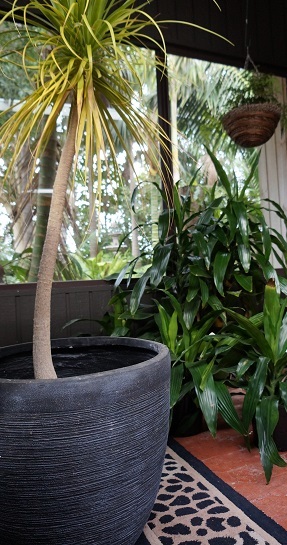 Most will look healthy, and grow well, when positioned in good natural light with no direct sun, and watered regularly. Feed in spring with a good slow release fertiliser and regularly wipe any dust from the leave with a damp cloth. 3 plants per 10 squared metres will be enough to clean your home or office. The average Australian living room is 20-30 squared metres, so 3 luscious lilies or perfect palms are all you need to be happy, healthy and wise. RULE NO. 1 – WATERING Most indoor plant deaths are due to overwatering particularly in Winter. 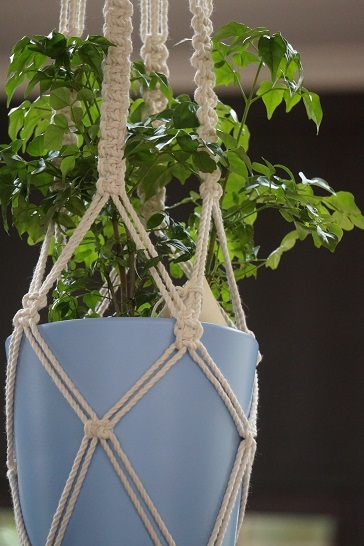 I am often asked “How often do I water?” That’s like asking “How long is a piece of string!” It depends on a lot of factors such as the air temperature inside, how much light they are getting and the particular plant. 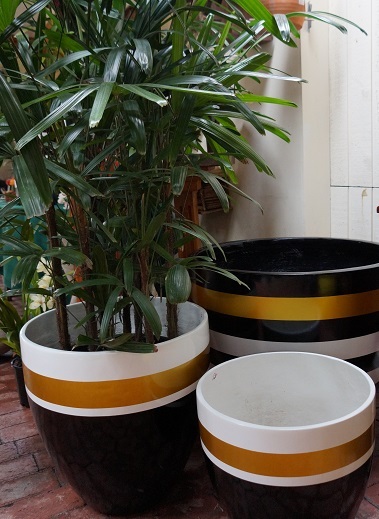 Generally though indoor plants require more water in the warm months and less in the cold months. This is because in the colder months they won’t be growing much or at all. As a result, cut the watering back, unless the room is heated of course. But even then growth will slow down as there are less daylight hours for the plant to grow. I guess as a rule of thumb I water my indoors once a week in the warm months (on a Sunday night, easy to remember the last time I watered) and maybe every 10 days to 2 weeks in the depths of Winter. Best idea is to put your finger in the soil down to a depth of your middle finger joint. If you can feel any moisture, don’t water it. If it’s dry, water it. Don’t EVER let your indoor plants sit in a saucer full of water, unless the plant is big, filled the pot full of roots and it’s Summer. Imagine if I made you stand in a bucket of cold water for weeks on end in the Winter. Not only would you have a bad case of tinea but your feet would rot away and you’d end up feeling pretty miserable. Plants are the same. If you are using a saucer so the water doesn’t stain the white shag pile rug, tip it out after watering. RULE NO. 2 – LIGHT All plants require light to photosynthesise so they can grow and prosper. However the amazing thing about plants is they all have different light requirements. Apart from a few plants, none like being in front of a window getting full blasty sun, they will just shrivel. So partly draw the blinds, particularly in Summer and all will be well. Likewise, don’t make the mistake of putting them outside for a breather, even if it is in the shade. Indoor light is a lot darker then outdoor shade and the likelihood is the plant will burn or get damaged leaves. I’ve seen many plants made kaputski because of this. Also remember that in the cooler months outside is colder than inside and the plant will get the shock of its life if you throw it out for some R&R. RULE NO. 3- WASH ME Every now and then it’s a good idea to wash the plant’s leaves. It opens up its pores, cleans away the grime and dust and makes your indoor plants feel rejuvenated and fresh again (sounds like a cosmetic commercial). Now if you are looking for some meditative hobby, and chanting is not your thing, then grab a bowl of room temperature water and a cloth and wipe each and every leaf. It is quite soothing I must say – but not for those on a deadline. Your other option is to take your indoor plants to the shower and turn on the tap. They will think they’re back home in Borneo and in the middle of a monsoonal downpour. You could even get the kids to make thunder noises and flick the lights on and off to simulate lightning. That will occupy them for at least 25 seconds. But the plants will benefit enormously. RULE NO. 4- FEED ME Easy. For most indoor plants, buy an indoor slow release fertiliser like Osmocote, or Nutricote. You only have to do it once every 3 – 4 months or whatever the time is on the packet. Don’t use an odorous fertiliser, I did once and ended up attracting all manner of creatures into my space. Also if you own a Labrador, or similar, they will eat it, which is good for the dog, their coat will shine like never before. But the plant will miss out and it’s the plant I’m concerned about. RULE NO. 5 – FRESH AIR Like us, indoor plants will be much happier with good ventilation and a nice airy environment. Most indoor plants like shade but they don’t want to live in a cave. Good ventilation doesn’t mean cold and draughty though, remember that in Winter. RULE NO. 5 – CHOOSING THE RIGHT PLANT Very important. Plants all have their particular requirements, so you need to be aware of what they are before you buy them. Easy to buy the very showy, big leafed beauty that’s been raised in the perfect environment, but unless you can supply it’s needs it isn’t going to look like that in a month. Likewise, you have a set of requirements dictated by your lifestyle. If you’re a busy little sausage you aren’t wanting to own a plant which needs regular watering and attention. My advice with indoor plants is do some research before you buy and come to the nursery and ask the staff for some suggestions about what would suit your space. A photo on the phone is always good. Do some research and be amazed at the natural health benefits of indoor house plants. Watch this 4 minute video to find out more. The plants recommended here are: Areca Palm (Golden Cane Palm); Mother in Law’s Tongue and Money Plant (aka Devil’s Ivy or Pothos). We stock these plants all year round.